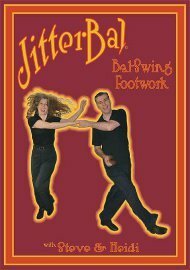 This instructional DVD is for the Intermediate Lindy Hop and Balboa dancer and contains the fun and fancy Footwork to make you an outstanding Intermediate to Advanced Bal-Swing dancer. You should know the Balboa, Bal-Swing and Lindy Hop Basics. Champions, Steve & Heidi are considered one of the best Balboa & Bal-Swing couples in the world, famous for their phenomenal footwork and creativity. With over 25 years of combined teaching experience, you can now have them in your very own living room, and learn from the best Balboa and Bal-Swing dancers while having fun! You can also purchase the DVD at: Jitterbal.com. Please visit Heidi's website to learn more about her innovative Jitterbug - Balboa swing dance fusion dance experience! It’s something that needs to be said more often, “Don’t dance like a 70-year old man…” Balboa and Bal-Swing were danced by teenagers as an “all out” swing dances in the beginning, and, as those “kids” got older, it tended to slow down - and then slowed down some more. But, it’s saa-wing d-ancing and meant to be “all out fun.” Nobody dances Collegiate Shag slowly, but it’s mostly because nobody filmed those people getting old, and/or, because old people just give it up and dance something else - slower.